The Board of Directors is the governing body for the co-owners of the Boise Co-op. It is composed of nine co-owners, elected by co-owners. Terms for directors range from one to three years as needed to ensure no more than three terms are scheduled to expire every year. The Board is responsible for ensuring organizational performance on behalf of the Boise Co-op’s co-owners. This work includes developing clearly stated expectations through written policies; delegating responsibility for, and authority over, the achievement of stated objectives; and monitoring compliance with written policies. The Board is a strategic and visionary body with a view toward the future of our cooperative, rather than focusing on the short term. The Board of Directors meets each month, typically on the second Monday from 5:30-7:00 pm. Co-owners are invited to attend our monthly Board meeting. This is a great chance to learn more about the workings of the Co-op and voice any questions, concerns, or compliments you have! Check the calendar for the most up-to-date info on when and where the next Board meeting is happening. Over the last ten years, Shannon has held a variety of roles within the Boise Co-op; Co-Owner, consultant, former employee, and currently serving as President of the Board. She is an activated advocate that supports the Co-op’s values and principles. As a locally recognized leader in community health, she brings a diverse view and experience to the challenges surrounding food systems. Shannon has a strong passion for food because of its dramatic effects on our social, environmental, economic and human development. Whether it’s urban farms, childhood obesity, food cooperatives, plant-based eating, or building food education and empowerment destinations, Shannon is working to bring food to the forefront of the conversation. Shannon’s motivation for continuing on the Board of Directors is to help support and grow the Boise Co-op’s position as a community leader in local food system development in the Idaho. Robert has lived in Boise since 1977 and has been a member of the Co-op since 1978. Rob is a founding partner in the Boise law firm Anderson, Julian & Hull LLP. He specializes in civil litigation and construction law. He has been a member of the Design Review Board for the City of Boise and is a charter member of the City Club. He also has served on the Board of Directors for Idaho Attorneys Against Hunger and Idaho Partners for Justice. I grew up on a small, family run farm in Wisconsin. It was there that I learned that the way we care for the land, animals and our neighbors directly affects our community and throughout my time in different places I have tried to be a part of organizations that shared these same values. When my wife Krista and I moved to Boise in 2006 and found the Co-op right in our neighborhood we were so happy to have a place that was committed to connecting consumers and farmers that becoming a member was the easiest decision we ever had to make. Being a part of and supporting an organization that shares our passion for creating strong relationships with local farmers and producers and watching those relationships evolve and grow has been very gratifying. I’ve been a hospitality professional for nearly 30 years and have developed and opened many different styles of restaurants and being connected to local purveyors played a huge role in the success of these places. My connection to the Boise community was strengthened during my time as one of the founders of the restaurant State & Lemp where we were deeply focused on highlighting the food, wine and beer grown and produced in Idaho. Alex has been a part of the Treasure Valley community since 1971 and a Co-op co-owner since 1980. She worked in the Co-op’s Customer Service Department from 1996 to 2005, then was elected to the Board in 2007. Alex works for Mountain States Group as a coordinator for the Retired and Senior Volunteer Program and Foster Grandparent Program. Mary has been a member of the Co-Op since the mid 1990’s, and began shopping at the Hill Road store in the early 1980’s as a teenager. She has been supplying the stores with baked goods for re-sale since 1992. Because she's been both shopping and selling at the Co-Op for so long, she has considerable knowledge of how the stores should and do function. She is intimately familiar with Co-Op customer shopping tastes and community interests, and has witnessed the changes that have occurred in the Valley over the past 35 years. She looks forward to applying her knowledge and experience to help the Co-Op grow and thrive in an evolving market and community. She would like to help shape the future of the Co-Op. Zach's family has been Boise Co-op members since before he can remember. He grew up running around the receiving rooms and bakeries of the Boise Co-op as it grew and moved around the North End. His family has been intimately involved with the Boise Co-op since its inception. In fact, 11 members of his family have worked for “The Co-op.” A combined 65+ years of service to the Boise Co-op and the greater community. He was lucky enough to have been employed by the Boise Co-op from 2005-2015 as the “Pet Food Guy.” He helped conceptualize and manage the Boise Co-op Pet Shop which opened in June of 2013. He has been actively involved in the Boise music scene as a member of several local bands and as a local visual artist. He loves “the Co-op” and is excited for an opportunity to continue serving its customers, members, and community. I’ve been a member of the Co-op since 2013, and have had the pleasure of serving on the Board of Directors this past year. I’ve truly enjoyed making connections with the employees and members, and being connected with a cooperative that supports the quality of life offered in the Treasure Valley. Having been raised by farmers, ranchers, and a father who was president of his city’s community garden, the Co-op has a sense of home to me and I relate to their vision of a health-conscience lifestyle. Being a marketing professional, owning my own small business for the last 15 years, and my experience in a large retail company, has helped me understand our community, the importance of local and customer relationships, plus how to thrive with change. I’m passionate about being a catalyst in connecting people for a cause I care about, and preserving farmlands. 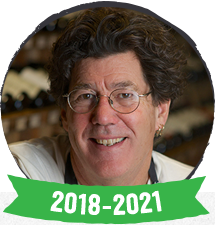 Artist, Musician, Chef and Wine Guru Divit Cardoza has lived in Boise Idaho since 1971, and has been involved with the Boise Co-op since it’s inception. As a founding member on Broadway Avenue, and following the arc of the Co-op to it’s current to store success, Divit has been involved at every location. On 13th street he worked produce, bulk, HABA and cashiering. It was there in 1979 that he originally suggested a beer and wine department for the store. In 1984 that idea became a reality at the Hill Road location and Divit took charge of the wine department, seeing unprecedented growth for decades. This continued to the current location on Fort Street and the separation of the wine department in 2007. Divit retired from the Wine Shop in the end of 2017. Charles is a long time Boise resident and a Boise High School graduate with deep roots in the community. In 1975, when the Co-op was located in Hyde Park, he volunteered forty hours a week for six months before becoming the Co-op’s second full time employee. As a Co-Manager of the Co-op he championed and developed the innovative and organic product selection that has become the standard today. In the early eighties he served on the Co-op Board, both as Vice-President and then President. This was when the store was located on Hill Road. From 2015 through 2017 he served as the Co-op Board Administrative Assistant. During that time he attended the Consumer Cooperative Management Association’s yearly event and returned with the desire to create better communication between the Board, employees, and the Membership. As someone who frequents the North End Store, he is recognized by most of the employees. This is because he engages them and recognizes that they are the most important asset of the Co-op.